The project was to design a temporary office space for Alexa Chung's new fashion label. Working closely with the brand and Grosvenor Estates the brief was to design the office space within "The A Frame", located in the courtyard of Eccleston Place in Westminster, London. It was essential that the design solution was temporary, so it would be able to suit the expansion of the new brand. I designed a flexible furniture solution that is moveable and created with low-cost temporary materials. 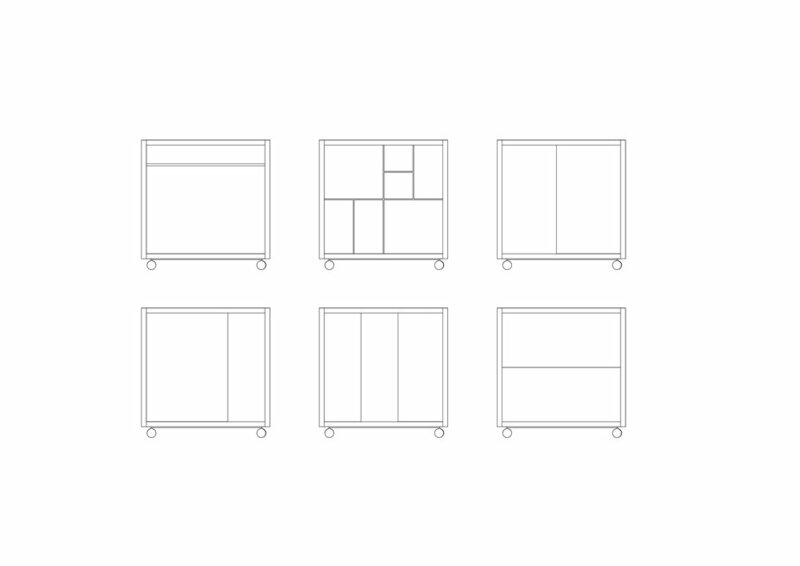 The boxes comes in four different sizes and can be used as either a clothing rack, shelving system or to create a space either within the boxes or outside. The employees can inhabit them as office spaces, meeting rooms or just as a break-out space. To create a more private box or space, it's possible to add a sliding screen in different materials - which depends on how private you want it. The materials and color scheme is specially chosen for the client. The furniture solution comes flatpacked and it is easily transported to a new location.